Johnny Depp in "Dead Man." Dead Man is a vastly uncompromising Western. It has all of the typical Western archetypes, yes, but the way in which it goes about them is extremely unorthodox. The film is centered on a young Johnny Depp, who plays William Blake (not to be confused with the poet, although that will come into play later on). Blake is on his way to the town of Machine for a job that has been promised to him. On the train, he is warned that his grave awaits him in Machine. Of course, he pays no attention and only treats the warning with mild shock. When he arrives, he is informed by the rifle-toting boss Mr. Dickinson (played by Robert Mitchum) that the job is no longer available. Depp, disgruntled and betrayed, leaves and heads to a bar. There, he meets a pretty girl (Mili Avital) and the two set off to her apartment to engage in sexual activities. But their fun is interrupted by an angry ex-boyfriend (Gabriel Byrne), who kills the girl and then is killed by Blake. Blake is wounded in the process and escapes through a nearby window, just before he collapses. He awakes to an Indian named Nobody who believes him to be the real William Blake, the poet William Blake. Nobody takes Blake under his wing for a spiritual journey and awakening. Meanwhile, back at the ranch in Machine, the man that Blake killed happens to be Mr. Dickinson’s son. Dickinson learns that it was Blake that killed his son, most likely out of anger for the unavailable job, and hires a trio of bounty hunters to find and kill Blake. Now, that’s where the plot actually begins. But it delves into much, much more. More than I can possible explain with words. Jim Jarmusch is a director that always has a purpose behind everything that he does, but here in “Dead Man”, I just can’t figure it out. 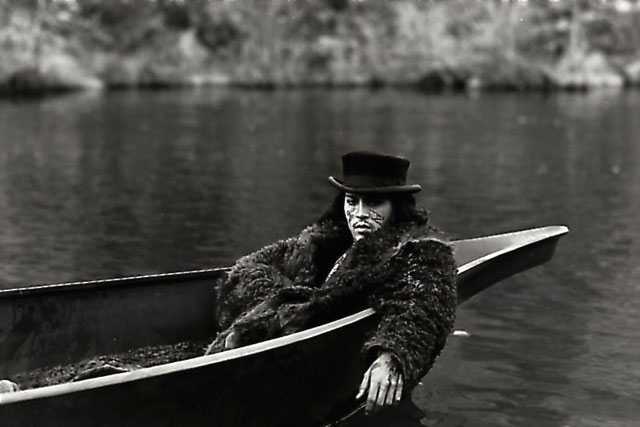 In fact, Dead Man is so unorthodox about the way that it goes about everything that I lost interest rapidly, more and more so as the film progressed. It turns into a wild and almost acid-like trip, but without the flamboyant colors that an LSD-trip would contain, as it is in black-and-white. So, it’s more like some weird lucid dream. I hated the look of the film in general. The cinematography was bland and uninteresting, the characters looked ridiculous, and the black-and-white was gritty and unappealing. I understand what Jarmusch is trying to do in defying the traditional laws of the Western film, but he took it too far. Dead Man is essentially a Western in drag–colorless drag, that is. Of course, Depp is good in his lead role. He remains to be such a formidable actor and can mold quite well into any character that he portrays. I also liked Michael Wincott and Lance Henriksen in their bounty hunter roles. They had good chemistry and could be quite funny at times. As for the rest of the cast… Eh, not so much. By saying this, I’m not saying that Jarmusch is an inept filmmaker. He’s had many a great film, but this is most definitely not one of them. I understand that this is probably considered as a “love it or hate it” film, and while I didn’t exactly hate it, I didn’t quite care for it.